Last year’s long, hot summer took its toll on the nation’s lawns, with high demand expected for products to green-up and rejuvenate tired-looking turf. ecofective® Natural Lawn Feed is ideal for getting family lawns into shape in time for summer, resulting in lush, green lawns to enjoy during the warmer months. This concentrated liquid lawn feed is derived from natural ingredients, resulting in a faster uptake of nutrients with rapid results. Natural Lawn Feed is perfect for smaller urban gardens or larger gardens with small lawn areas. Not only does it ensure that lawns look good quickly, but its formulation, which is also used extensively by professionals, helps control diseases and moss. For added reassurance, the feed is child, pet and bee-safe. Easy to dilute and apply with a watering can or sprinkle bar, a 1.25-litre bottle is sufficient to cover 125 square metres. 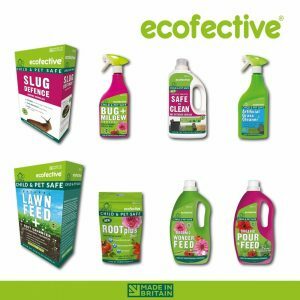 Also new for 2019 is ecofective® Artificial Grass Cleaner. Simply spray and leave and its dual-action formula effortlessly removes grime, grease and dirt from synthetic turf, while battling against a wide range of algae, fungus and bacteria to prevent further growth. Artificial turf is left fresh, thanks to the formulation’s powerful deodorising qualities, which creates an authentic freshly cut grass fragrance. The product is safe to be used around children, pets and beneficial insects, including bees, and will even clean pet mess from synthetic turf. Artificial Grass Cleaner is available as a 1-litre ready-to-use or 1.5-litre concentrate. ecofective® Water Storing Granules will be a must-have product for consumers who are keen to keep pots, tubs and hanging baskets in top condition should the UK experiences another hot summer. These starch-based hydrating granules absorb over 80 times their own weight in water, forming a gel around root systems that releases water precisely where it’s needed, cutting down on the requirement for irrigation. The product fits in seamlessly with ecofective’s environmentally-friendly ethos, as the granules are made from a blend of natural plant materials and minerals. They’re bio-degradable, non-toxic and odourless, and safe to use around children, pets and beneficial insects. Used by professionals, Water Storing Granules are supplied in a 350g pouch. 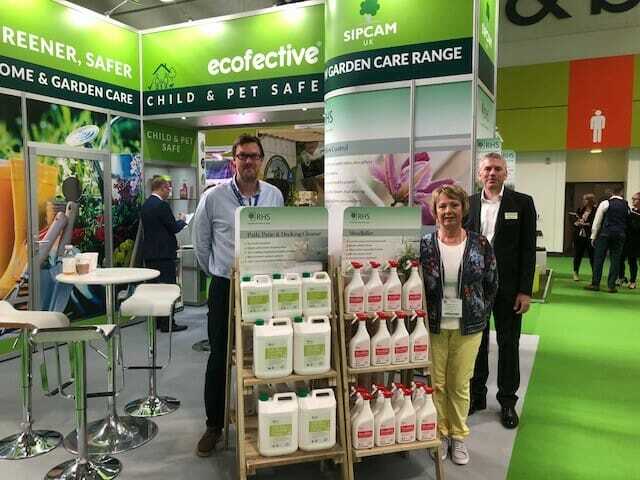 The introduction of RHS Garden Care products, licenced by the UK’s leading horticultural society, brings the trusted Royal Horticultural Society brand to the garden care market for the 2019 season. RHS Weedkiller is a glyphosate-free advanced formula for annual and perennial weeds, offering powerful contact action and results in 24 hours. Its advanced acetic acid biodegradable formula can be used on paths, patios and gravel, as well as for targeting weeds between plants and vegetables – without leaving any residual effects. RHS Moss Killer is based on an advanced acetic acid biodegradable formula too, offering best results against moss and small weeds less than 10cm high. With the government ban on metaldehyde chemical slug pellets looming, and metaldehyde-based products set to be cleared from store shelves by the end of June, RHS Slug Killer will offer an effective organic solution to the menace of molluscs. Suitable for use around ornamental and edible crops, this rain-fast pelleted bait contains ferric phosphate, a naturally-derived ingredient that stops slugs from feeding and ensures they move away from the area after they’ve taken the bait. Available in a 600g container. RHS Bug and Mildew Control will cater for the needs of consumers who want to control a wide range of bugs such as aphids, blackfly and red spider mite without resorting to chemicals. Its pesticide-free formulation also tackles powdery mildew and provides foliar nourishment. Ideal for use on flowers, fruit and vegetables, no harvest interval is required, and produce can be eaten hours after application. Available as a 1-litre RTU or 500ml concentrate. For consumers looking to clean hard surfaces of slippery and unsightly algae after months of wet winter weather, RHS Path, Patio and Decking Cleaner offers a solution without using any harsh chemicals. No scrubbing is required, and the product is safe to use around wildlife, ponds and pets, with a 2.5-litre container covering up to 80 square metres.